Three international stories are united by a love of coffee. 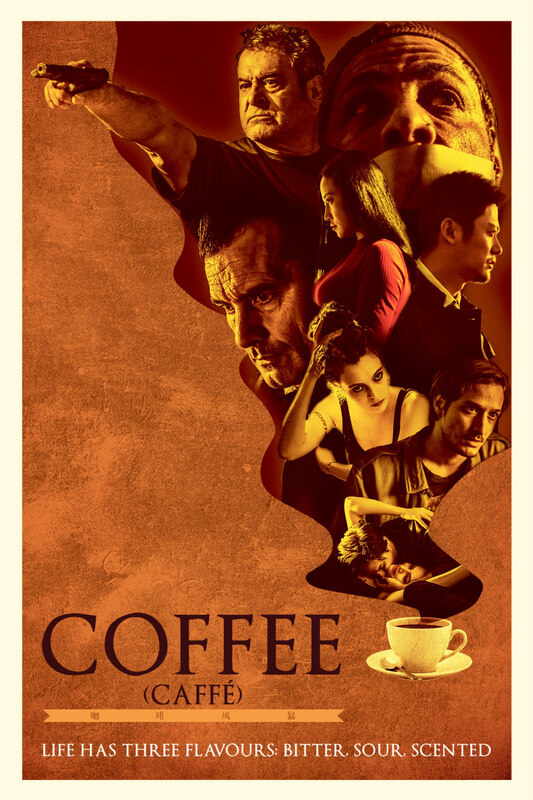 Anthology film Coffee (original title Caffè) boils down to three stories; Belgian-Arab Hamed (Hichem Yacoubi) looking to reclaim his antique coffee pot after it was stolen by rioters; Italian coffee maestro Renzo (Dario Aita) down on his luck and planning a theft of highly expensive civet beans; and Chinese businessman Ren Fei (Fangsheng Lu) returning to his hometown to oversee a factory based among expansive coffee plantations. An Italian-Chinese co-production set across three countries with only a vague thematic link, Coffee leaves a lot to each section to devise their own storylines, and each manages with partial success. The Belgian section probably has the most action; on a kinetic level the highlight of the film is Hamed running to his shop in the midst of a riot after seeing it on the news. It is also taking a look at the Islamophobia currently besetting Belgium and Europe as a whole, in a manner somewhat heavy-handed but nowhere near the ludicrousness of last year's Freesia. The inherent decency of Hamed is contrasted with the laziness and cruelty of layabout Vincent (Arne De Tremerie). Even in spite of these differences, Vincent's father (Koen De Bouw) is desperate to find the bad in Hamed as justification for his prejudices. As Vincent's conflict with Hamed escalates, things start to get a little wild, and events and actions begin to strain believability and enter the realm of deus ex machina. The Italian section is perhaps the most simplistic but also the most consistently engaging of all three storylines. We understand Renzo and girlfriend Gaia's (Miriam Dalmazio) desperation, not just through their quest for maid and labourer's jobs, but moments such as their first new home in Trieste turning out to be a squat scheduled for demolition (there are even holes knocked into the walls for the explosives to be placed). In these circumstances Renzo's actions can be understandable, stealing from the privileged in what should be a victimless crime. Vincent's decision to steal Hamed's antique coffee pot is likewise borne from unemployment and a complete lack of options. The gorgeous scenery of Chinese valleys is wonderfully captured by director Cristiano Bortone in the third story. However compared to the action of the European sequences, instead of grounding the film with its contemplative nature it serves more to disengage the viewer. The stakes of Ren Fei's conflict between his boss's desires over the need to protect the community from a disaster at the factory are never fully explored. His own internal struggles feel a little corny and stereotypical, and it is a shame mentions of his travelling to Belgium and linking the stories are never followed up on. Coffee the drink makes me nauseous and depressed, and I haven't drunk any for almost 10 years. This exacerbated some of this film's pretentiousness, especially in an overlong scene in which an artist who paints with coffee attempts to make Ren Fei learn to love the drink that defined his early years. Coffee the film's disparate settings does make an interesting rumination on the drink's ubiquity, though there is nothing in the film that couldn't be done with wine, whiskey, caviar or any export with history. My own dislike of the drink may not help, but this connecting tissue straining to hold the film together had little emotional resonance. Plot turns may at points be melodramatic, but the characters and dialogue in Coffee are naturalistic and engaging. This is also a film that is able to capture moments of beauty, whether in an Italian flophouse or a Chinese boardroom. It is then a film for lovers of both coffee and arthouse films, though outside of that Venn overlap there may not always be enough to engage the viewer. Coffee is on VOD February 9th and DVD May 15th.